August 16, 2018 – Dubai, United Arab Emirates: To celebrate the launch of its new online ordering app, 800 DEGREES NEAPOLITAN PIZZERIA, an Italian concept originating from L.A. has announced an irresistible offer for all pizza lovers. 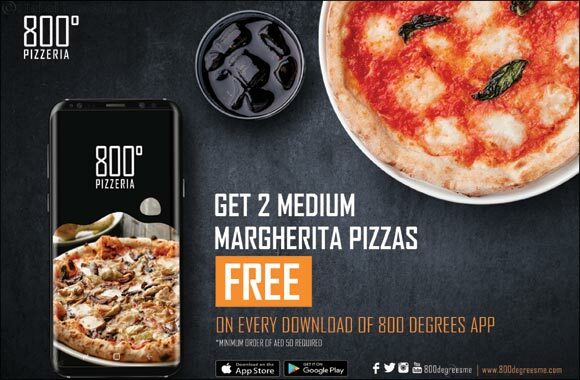 On every new download of the ‘800 Degrees’ app, customers will receive 2 medium Margherita pizzas absolutely free on minimum order of AED 50 purchased through the app. This tempting offer can be availed from August 15-31, 2018. The Italian joint, popular for its traditional Neapolitan pizzas, recently launched its new app to strengthen its own online delivery platform. Hosting an array of new features and offers, the new app is easy-to navigate and let’s the customer order from any store of their choice. The app also allows the customer to arrange a pick-up from the store after placing an order online. On downloading the app, two Margherita pizzas can be redeemed absolutely free if the order is placed from City Centre Me'aisem or Mall of the Emirates branch. 800 Degrees app is now available for download on iOS and Android platforms. To further strengthen sales via its online delivery platform, 800 Degrees has unveiled its new Loyalty Plan titled ‘800 Degrees Loyalty Club’. As per the program, every point earned is equivalent to AED 1. Customer wallets are already preloaded with 15 points. Rewards on the Loyalty Plan are based on different Tiers that depend on numbers of orders placed via the website. Under Tier 1, (1st-4th orders), points worth 10% on the sub-total amount get credited into the customer’s wallet. Under Tier 2, (5th – 9th order), points worth 15% on the sub-total amount can be earned. Once the customer reaches Tier 3 (10th order and above), points worth 20% on the sub-total is added to the wallet. Customers can further accumulate points worth 7% on the sub-total when placing their order on Zomato. The minimum order for point redemption is AED 50, while a maximum of AED 40 points can be redeemed per order. Customers are also rewarded for writing a feedback with 2 points. Manish Jeswani, the Managing Director of Eaters LLC and franchise rights owner of the US based 800 Degrees Neapolitan Pizzeria, said, “As we are witnessing a splurge in digital technology within the food industry, we’d like to boost our own digital platform, to capitalize on the growing needs of the market. By improving our online delivery platform and developing a comprehensive loyalty programme, we intend to directly engage with our customers with innovative offers and seamless service while motivating them to come back to us for more. 800 DEGREES specializes in handcrafted and customized pizzas catering to varied palates, making the pizza delectable even for customers with specific dietary requirements. Baked in a wood-fired stone hearth pizza oven at 800 degrees Fahrenheit, the Neapolitan pizzeria not just offers pizzas, but also hosts a range of authentic Italian delicacies, right from pastas, burratas, salads to specialty desserts and coffee. The brand currently operates from four locations – Mall of the Emirates, City Centre Me'aisem, Dubai Parks and Resorts, and Last Exit. Previous Story : Have some fun with Top Chef this weekend?